While in the car this morning I heard an advert on the radio for a well-known national pub/restaurant chain (I’ll keep the brand anonymous) saying why not come in today to try our new kids menu with pizza, burgers & our new hotdogs!! This advert has really got me angry and thinking… Why do we need kids’ menus? Surely we should be encouraging our children to be adventurous with food as well as developing their palette and just allow them to have a choice from the main menu but have smaller portions? I’m not a parent myself so I don’t have first-hand experience of eating out with children but I do know that serving them beige food such as the choices given above as a meal isn’t a healthy choice. When I was growing up my parents would often refuse the kids menu and ask if we could just have something off the main menu, and if the food was cooked fresh the answer was always YES. Are we giving children enough credit for actually wanting to try new foods? Every week we are hearing stories in the media about the state of health of our children and how they are likely to be the first generation that dies before their parents!! So don’t these pub chains have a responsibility to feed our children healthy balanced meals? And I don’t mean just putting something beige in a nice coloured box & give away a free toy!! This is just bribery?? What are your thoughts? 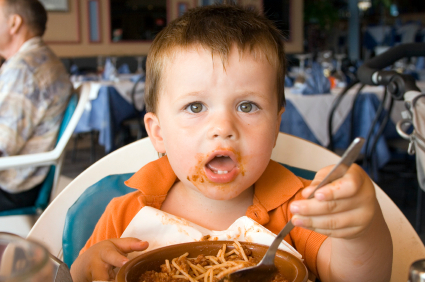 Do you agree with having a separate kids menu? What are your experiences with dinning with children? 2 Responses to Do we still need “Kids Menus”?